The Sites below are not under the control of TOOL ALFA- TOOL ALFA is not responsible for the contens of any Linked Site, without any limitation. TOOL ALFA is not resposible for webcasting or any other form of trasnmission reveived from any Linked Site. 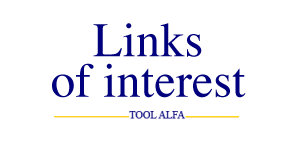 TOOL ALFA is prividiing these links to you only as a convenience, and the incluison of any link does not imply endorsement by TOOLS ALFA of the site of any association with its owners.